US Sudoku Team qualifying test is this Saturday. The results of this test will be used to select members of the U.S. team to participate in the World Sudoku Championship in Prague, Czech Republic, November 4-7, 2018. However this test is also open for participants from other countries. One can participate in this US Sudoku Team Qualifying Test online. This US Sudoku Team qualifying test contains some of very new Sudoku Variations. 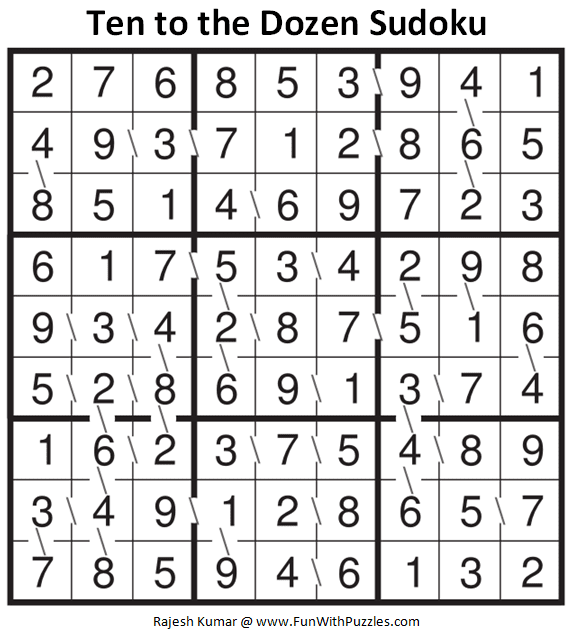 One of the variations I liked is Ten to Dozen Sudoku Puzzle. So these two Ten to Dozen Sudoku puzzles I am creating for practice for my friends who are going to participate in this Sudoku Competition. 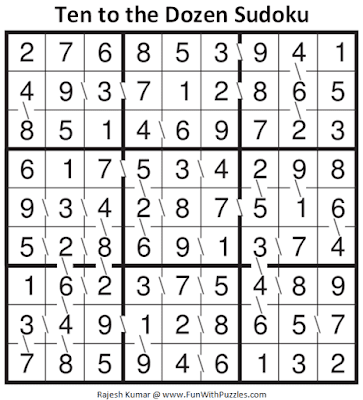 I am publishing these Ten to Dozen Sudoku puzzles in Fun With Sudoku Series as 343rd and 344th Sudoku Puzzles in this Series. Standard Classic Sudoku Rules apply. Additionally, the '\' in the grid indicate all adjacent pairs of digits whose sum or product is 10 or 12. 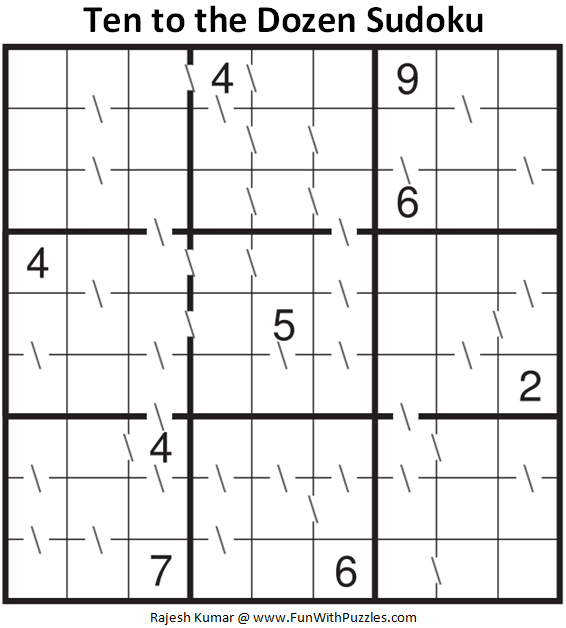 Answers of these Wilhelm Tell Sudoku puzzles can be viewed by clicking on buttons below. 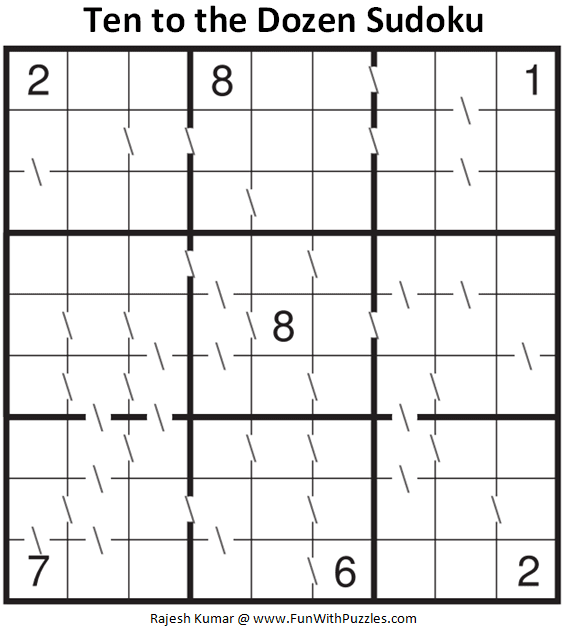 Please do give your best try to solve this Sudoku puzzles before looking at the answer. 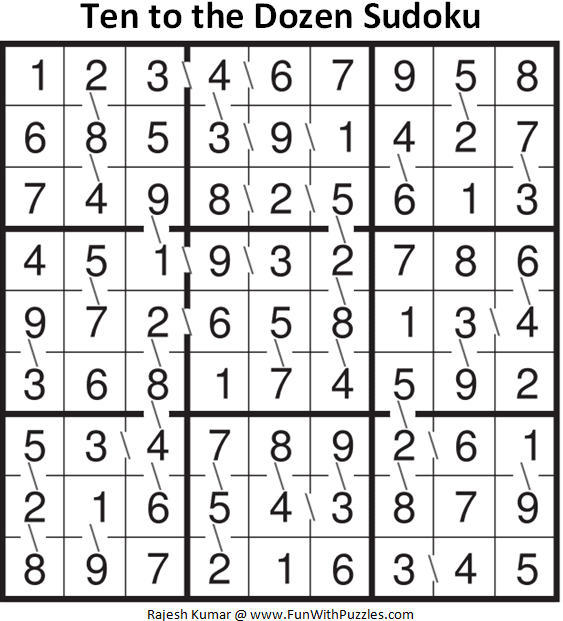 These two Ten to the Dozen Sudoku Puzzles I am publishing as #343rd and #344th Sudoku puzzles in Fun With Sudoku Series. 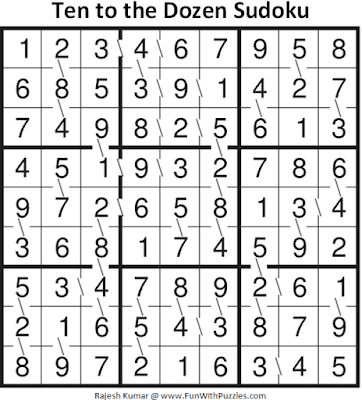 Here are the next are previous Sudoku puzzles published in this series.